You can select up to 14 travellers in total. Admire the best of Ravenna’s famous mosaics with a top-rated guide on this private walking tour. 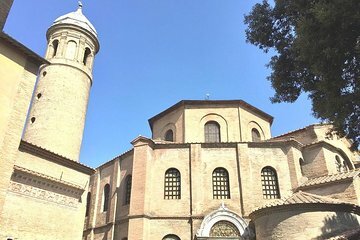 Home to eight different UNESCO World Heritage sites, Ravenna has so many treasures to see, it can be hard to know where to start. Learn the stories and symbolism behind the dazzling Byzantine and Roman mosaics that decorate churches and mausoleums, and see the tomb of celebrated poet Dante. Finish with a tasting of a ‘piadina,’ a savory flatbread and favorite street food specialty.